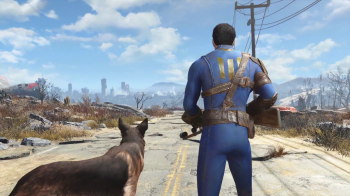 Bethesda's Todd Howard says that there are currently no plans for paid Fallout 4 mods. You might recall a few months back that whole Skyrim paid mods fiasco, where Valve and Bethesda teamed up in an effort to bring paid premium mods to Bethesda's mod-heavy open-world RPG Skyrim. Needless to say it didn't end well for both companies, leaving a very sour taste in many a fan's mouth. Naturally, now that Bethesda has announced it's next, mod-heavy open-world RPG Fallout 4, people are understandably concerned that Valve and Bethesda may try and pull the same trick again. Thankfully, Bethesda's Todd Howard has confirmed that there are no plans for paid Fallout 4 mods. In an interview with German gaming magazine Spiegel, Howard responded to a query about Fallout 4 mods by mocking the haste in which fan furor burried the "feature" for Skyrim. "How long [were paid mods available in Skyrim before being shut down]? 24 Hours? I can only speak for the present time, but currently there are no plans for a payment system [for mods]." Now, keep in mind that Howard did stop short of saying "no paid mods ever," and Valve specifically stated that it wasn't shelving it's paid mods initiative permanently, stating that it "believes there's a useful feature somewhere here," and it would re-visit it with a community that is not quite as entrenched as Skyrim's. This means that we could see paid Fallout 4 mods at some point in time in the future, but for now at least, we can breathe easy.